I used to be quite fond of Xtracolor's take on this paint, but my tin dried up after 15 years (who'd of thunk it?). So I tried spraying clear blue acrylic over a silver base coat, and quite liked the effect. Probably still a little too blue, but usable I think. I'll post a photo if I can find one. Does Xtracolor still make their version of this color or did they discontinue it? I'm just amazed at how many Zero kits there are and we still have to try and mix this color ourselves. I also noticed since I posted my first posting that for some odd reason Tamiya didn't give me the brown box with all its metal components and the cowling parts at all. I've never seen this in a Tamiya kit. So now I've got to try and contact them for a LOT of parts. Does Xtracolor still make their version of this color or did they discontinue it? I'm really not sure, to be honest. Xtracolor paints are close to impossible to get here in Australia now (or practically anywhere outside the UK), so their version of that colour is just no longer an option for me. But in reality, it was a tinted clear coat, and varied quite dramatically in actual colour, and also changed with exposure to UV light. So I wouldn't be too fussy about trying to replicate an exact colour. This has worked for my Aotake. Thank you Dave Johnson. Thin and spray as you would a wash with multiple light passes on a silver base. I used Alclad Aircraft Aluminum. Keep passes uneven. Looks really great! Maybe its just the angle of that last pic, but did you cut off the roll over bar? 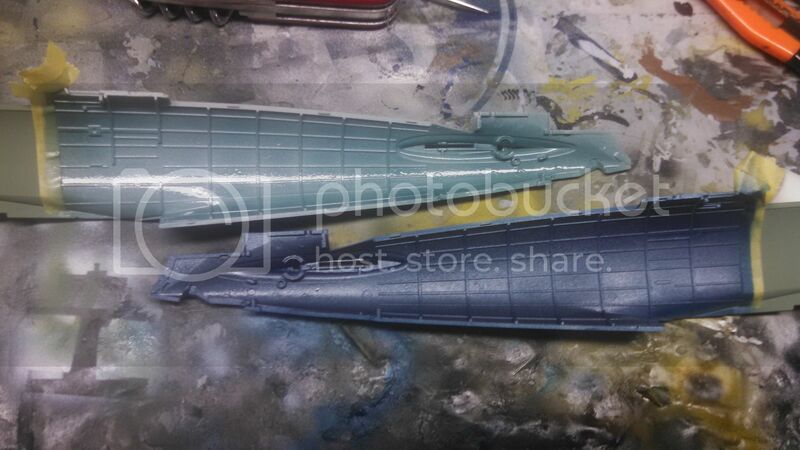 I think I got a close enough mixture this morning with mixing Tamiya's Metallic Blue with Model Master's clear green. I didn't like mixing two different manufacturer's paints but it's what I had on hand. To answer your question Brian, no I didn't cut off the roll bar, it's just masked with tape so it stays green. Good work Brady. That latest version of Aotake is actually pretty close to the Xtracolor version. Your first mix with the Tamiya acrylics is pretty close to what I get now. Now for another question. Did I paint Koga's Zero correctly so far or did I already mess up on what is and isn't supposed to be Aotake? I'm not sure but I think his was Mitsubishi. Any place to look up if it's a Mitsubishi or Nakajima built plane? 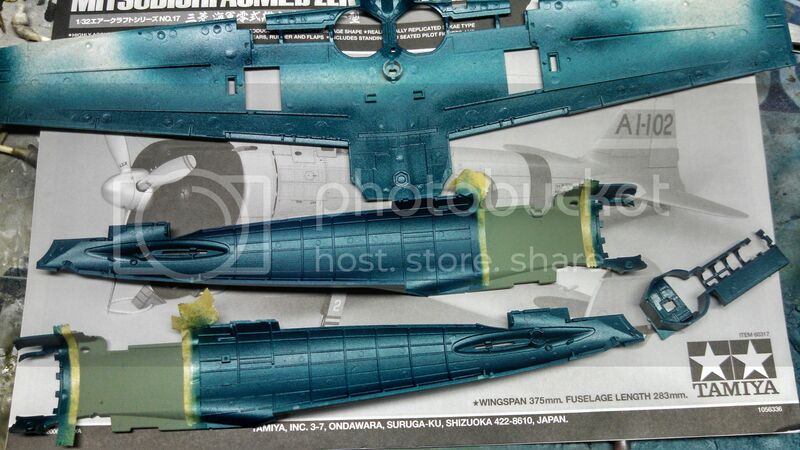 Gunze has an F-15 interior blue/ green that is also a reasonable stand in for Aotake. Lazy man's solution. OK, thanks for another suggestion for Aotake. Does anyone have an answer for my question on determining if a Zero was made by Mitsubishi or Nakajima? Kogas Zero was a Type 21, all those were Mitsubishi built. That will also mean wheel wells and inner gear doors in the same colour as the underside camo. Engine cowl and decking behind the pilot will be Mitsubishi Blue/Black. Cockpit will be Mitsubishi Interior Green. Both available from Gunze Sangyo, though only in the Laquer type, Cowl colour is C125 and the cockpit Green is C126. Bummer! It looks like I didn't do enough research here from the beginning. I've already painted this one wrong as far as internal colors. It sounds like the only build on my "To Do" list this Nakajima color scheme works for is a Rufe or I just strip it and start over. Ade Rowlands thank you for the paint references. I ordered some for both manufacturers. When the wheel wells were painted by Mitsubishi did they paint the tail wheel well the exterior color too? Was anything painted Aotake by Mitsubishi other than the interior of the cowling and the rings around the engine itself? Flaps? 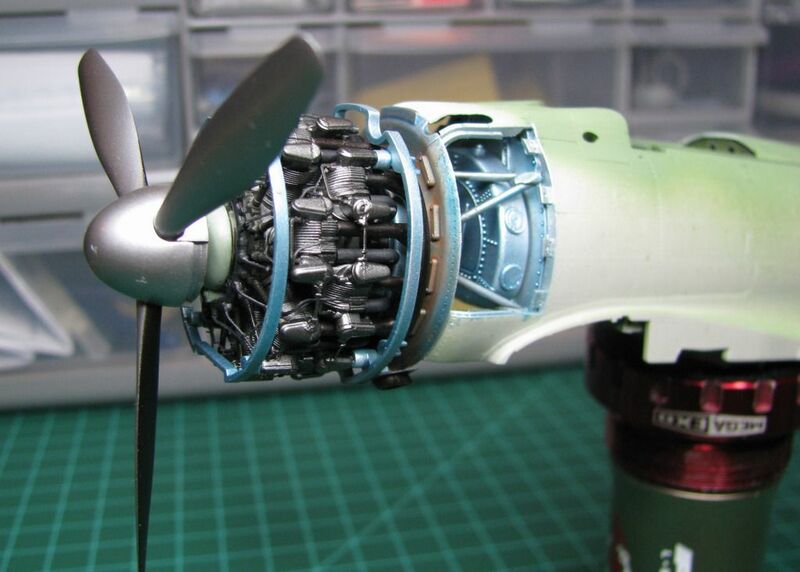 No, Nakajima built the A6M2's as well as did Mitsubishi. If it's an early build, the only way to tell the difference is on the data plate on the fuselage. Later overall olive-grey Najajima built A6M2's will have a 75km white surround on the fuselage Hinomaru.